I received the ShapeFits Eebee Doll from Eebee’s Adventures. I gave it this weekend to my newest nephew that was born this summer. He loved it! He immediately started chewing on one of the shapes. This is a great toy that will definitely grow with him. I really like the functionality and how it will work his motor skills. I was first introduced to Eebee’s Adventures at a MOPS convention a couple years ago. I previewed their video and was hooked! “eebee’s adventures are designed to engage you and your baby with rich play experiences that provide powerful lessons that memorizing letters, numbers, colors and shapes simply can and do not. 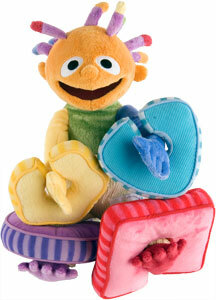 via Jamie’s Precious Peas: Eebee ~ Educational & Fun Baby Toys and Activities.